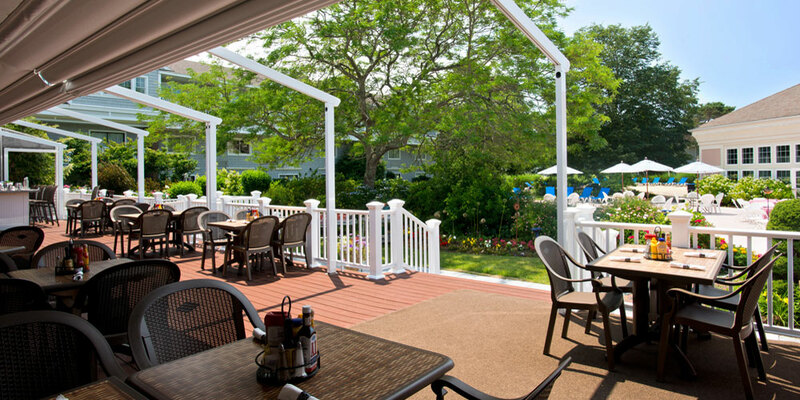 Outdoor Seasonal Dining on Cape Cod! The Deck will be open Memorial Day Weekend! The Deck is open part-time in the spring and full time in the summer months through Labor Day weekend. 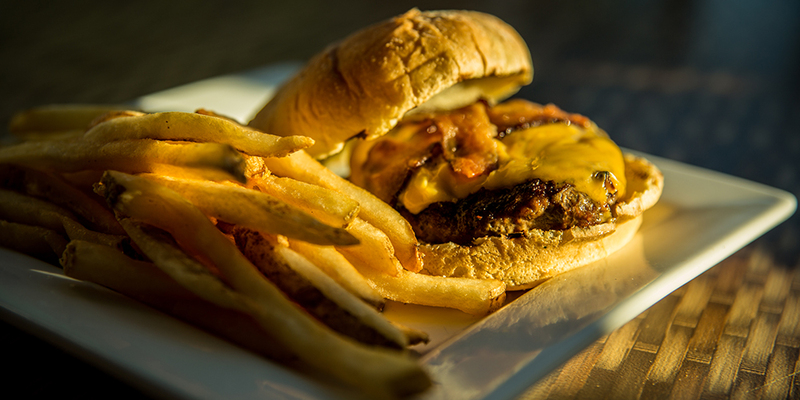 Serving Breakfast and Lunch from our Hearth ‘n Kettle menu. Classic New England style fare and contemporary American selections - eggs, bacon, sausage, omelets, pancakes or French toast! Enjoy hearty soups, outstanding sandwiches, crisp salads, seafood, chicken burgers and a Cape Cod Lobster Roll! Cocktails & Live Entertainment featuring Cape Cod bands and artists: Hazy, Hot & Humid, Troy and Dave, Alan McGarry, Chris Vincent, Jeff Lowe Trio and more! Craft Beers, Wine, Frozen Daiquiris, Pina Coladas, Mud Slides, Rum Runner, Mai Tai, Cape Cod Islander and Margaritas. 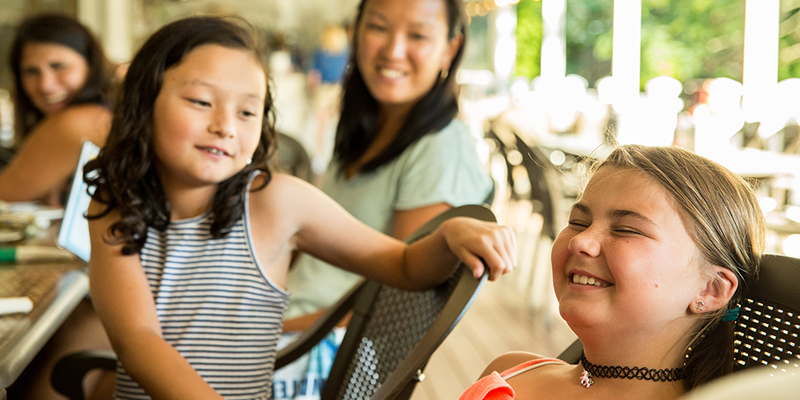 Dinner on the Deck is served from the Grand Cru menu. 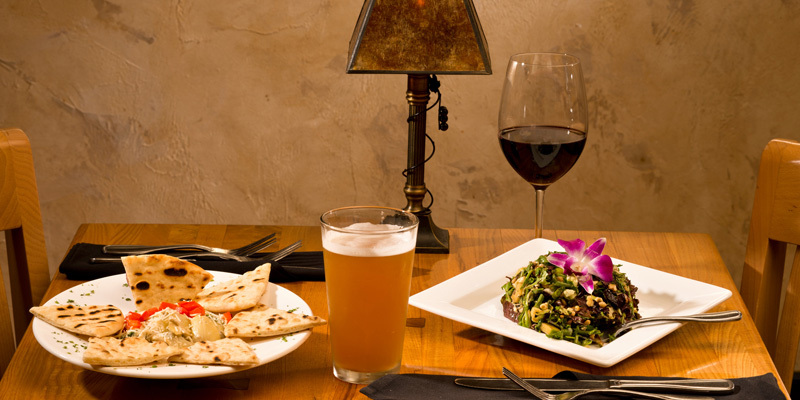 Creative regional fare, appetizers, salads, flat bread pizzas, sandwiches, burgers and nightly specials. Items include Crab Cakes, Jumbo Shrimp Cocktail, Fried Calamari. 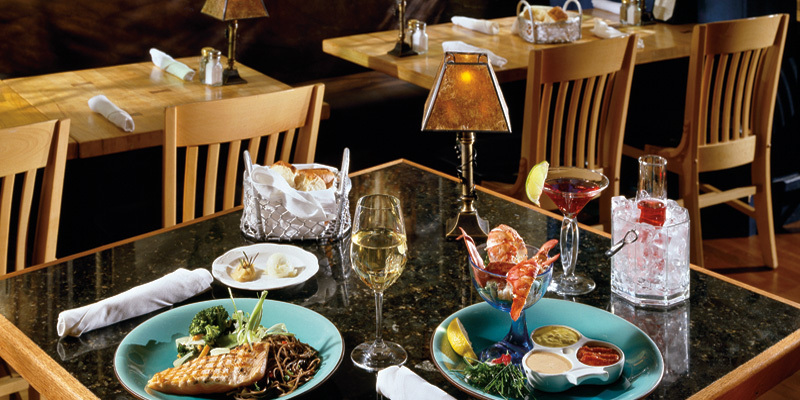 Entrees include: Atlantic salmon, Shrimp Scampi, New York Sirloin Steak au Poivre, vegetarian plate and many more. 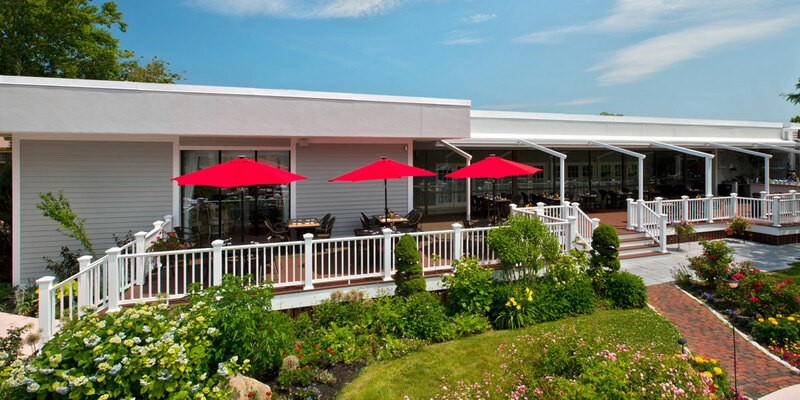 Al Fresco dining at the Cape Codder all summer....just another reason you'll never want to leave! Live Music on "The Deck"
Hazy, Hot & Humid Band: Two acoustic guitars, electric bass and three-part vocals. Music from The Eagles, James Taylor, Jimmy Buffet, Fleetwood Mac, America, Van Morrison and Crosby, Stills, and Nash – you’re going to love these guys! Performing every Tuesday, Friday, and Saturday in July and August, and September 1 & 2. Troy & Dana: Troy and Dana are a local Cape Cod soft-rock duo, performing a wide variety of popular covers on guitar and keyboard blending to create a rich overall sound performing covers from James Taylor, Jimmy Buffet, the Eagles and the Beatles. Performing Sundays July 1, 15 & 29 and August 12 & 26. 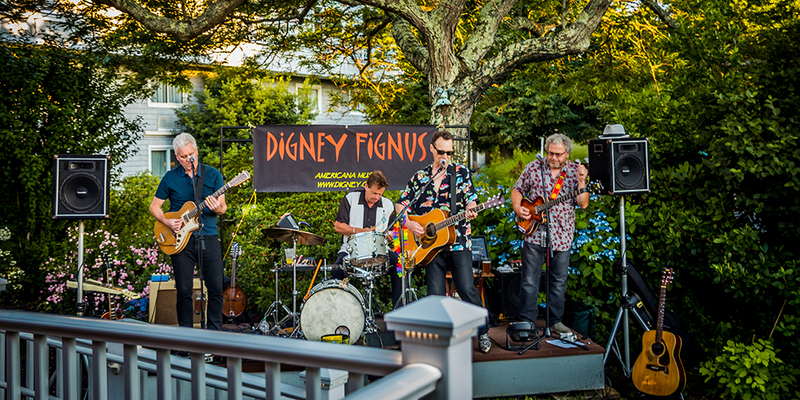 Digney Fignus: Live, whether unplugged or with a full rhythm section, the band is a fan favorite at festivals. The shows are high-energy full throttle fun that feature contagious songs that you'll be singing the next day. Bring your dancing shoes...Performing Mondays July 9 & 23 and August 6 & 20. Brian Kelly Fishmongers: A diverse experienced passionate solo acoustic guitarist/singer who embraces the old and new in acoustic roots music, classic folk/rock, and Americana genres. Performing Mondays July 2 & 16 and August 13 & 27. The Oysters: The Oysters are inspired by the pop music explosion of the 1950's, and play tunes from that era to get folks of all ages out on the dance floor to swing and stomp. Performing Sundays July 8 & 22 and August 5 & 19. We also offer live weekend entertainment inside at the Grand Cru Wine Bar & Grill.